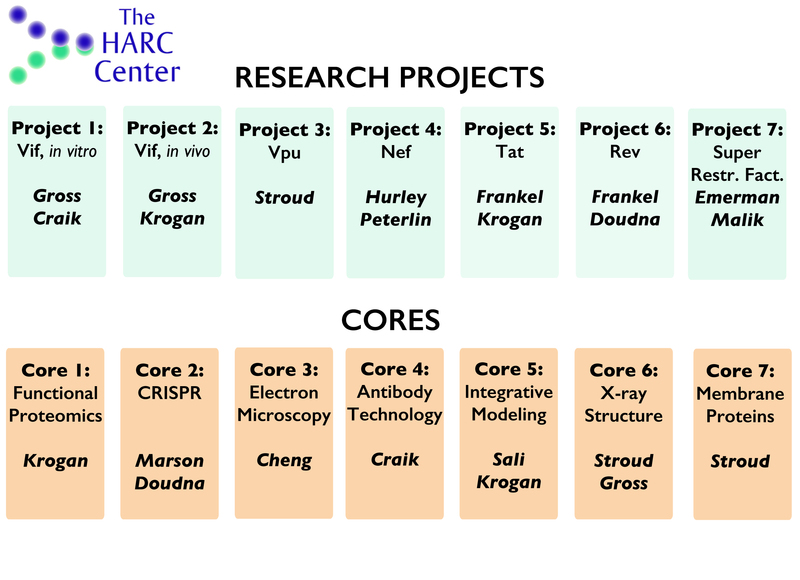 Within the HARC Center, there are 7 projects, focused on Vif, Vpu , Nef, Tat and Rev, as well as 7 cores that focus on development and integrated use of technology that allows for the understanding of the structure and function of HIV-host protein-protein interactions and protein complexes. These projects and cores bring together a diverse team of investigators and collaborators that span the breadth of technologies and biological expertise needed to elucidate critical HIV-host biology at a structural level. We also employ host genetic approaches that include our recent advancements in CRISPR/Cas9 gene editing with a particular focus on primary cells; systematic viral genetic studies; evolutionary genetic studies to help define novel restriction factors; as well as genetic information extracted from patient cohorts.